I enjoyed the John and Ruth’s Colombo’s hospitality last Saturday night, but Sunday was an even more eventful day. John and I drove to High Park to visit a large private library which holds all the core writings and correspondence of Madame H.P. Blavatsky. It was originally assembled before the turn of the century, and moved from London England, to Victoria B.C, and now resides in Toronto. I look forward to looking through a complete run of Lucifer and The Theosophist later this fall. We enjoyed a cup of tea with the present custodian and we both received an inscribed book of her poetry. We drove along the Greandier pond to visit Raymond Souster at The Grenadier Retirement Residence. Ray was in fine form, and I presented him with his Battered Box Medallion for publishing Millenium Madness (2010) I took the coin out of its acetate sleeve, so Ray could feel the surface of the coin because is blind, and accidently dropped it on his bedside table, it produced a rolling, bobbly, sonorous sound, which was impressive, and I must purposely do that in the future when other coins are presented. The conversation went back and forth between all three of us. Raymond talked of his projects scheduled for publication — Big Smoke Blues and Rags, Bones and Bottles and Not Counting the Cost (2011) and Easy Does It (2011). I discussed James Deahl’s introduction to the former volume, and we also discussed what to use on the cover. We discussed the founding events of The League of Canadian Poets, and these two fellows were two of the founding members. I took a picture of John and Raymond and both photos are included below. At mid-day John had to get home for a visit with his grandchildren, and I travelled south to the Metro Toronto Convention Centre to attend the 2010 Toronto Resource Investment Conference. It was a good conference, and I came away with a bag full of squeeze balls, hats, pens, night lights, water bottles and great USB memory sticks. Then off to 2010 Toronto Word on the Street at Queen’s Park. I did the rounds, and it was my subjective opinion that attendence was down for the year. I talked with all the usual suspects, gave and received much information, useful only to me, but essentially not gossip. Got a lead for Souster’s covers. Adjourned to Charles Pachter’s studio on The Grange Avenue and presented him with a Battered Box Medallion for his cover art “Oscar Wilde Moose Kiss,” and passed along one of those USB memory drives. Charles has a busy fall and we discussed new projects in the abstract. Charles is hosting an open house at his Ice House on Lake Simcoe over the Thanksgiving weekend. Retired to Chinatown for dinner … and home. I just received my invitation in the mail to the annual Stephen Leacock Medal Awards Dinner. It is scheduled for June the 12th in Orillia at Geneva Park, and promises to be a worthwhile event. Over the past number of dinners I have prepared pamphlets with content which may be of interest to Leacock Fans, and distributed to each attendee at their place setting for dinner. There are presently four in the series: Two Elegies (2005); Random Rhymes (2006); The Shannon and the Chesapeake (2007); and A Scandal in Montreal (2008). I took 2009 off as I was simply too busy being retired to prepare one. I had planned to do one discussing the poem “Casey at the Bat.” Now I’m glad I didn’t get around to it, because I now have new cover art by Charles Pachter. Carl Spadoni mentions in his Bibliography of Leacock, that he found an unattributed newspaper clipping from Montreal relating that Leacock had regailed the audience at a dinner speech with his own personalized version of “Casey at the Bat.” It was unclear from the article whether Leacock had recited E.L. Thayer’s version of the poem, or personalized it for Mariposa. If you google “Casey at the Bat” you find and audio version with De Wolf Hopper reciting the poem, as he did 1,000’s of times in his acting career. I would speculate that Leacock undoubtedly heard Hopper recite the poem, and was inspired to do it himself. Leacock was not known to play baseball, but he did pay Cricket, both in school and as a young adult. Shortly after I retired I received a letter from Martin Gardner, of Annotated Alice fame, in which he congratulated me for the publication of The Complete Annotated Father Brown. I called him to discuss the project and compare notes, and he was also interested about republishing a number of his out of print books. One of these was a fourth edition of his The Annotated Casey at the Bat. Next, I was working with Charles Pachter, a Toronto pop culture artist, essentially Canada’s Andy Warhol to develop an image of Sherlock Holmes and Dr. John H. Watson, and this project is still very mcuh a work in progress. But in any case during the preliminary conversation, Charles mentioned that he had a cottage studio on Lake Simcoe located a 20 minute drive from Orillia. I invited him to do an image of Leacock at the bat, but not baseball, but rather cricket, and I attach his creation for your consideration. During the same visit, I also spotted two other Pachter images in the studio, and obtained permssion to use them as well. The one is for Raymond Souster’s next collection of poetry entitled Big Smoke Blues. The image itself is entitled “Tour de Force.” and it is neat image of a Moose on a tightrope in the shadow of Toronto’s CN Tower. 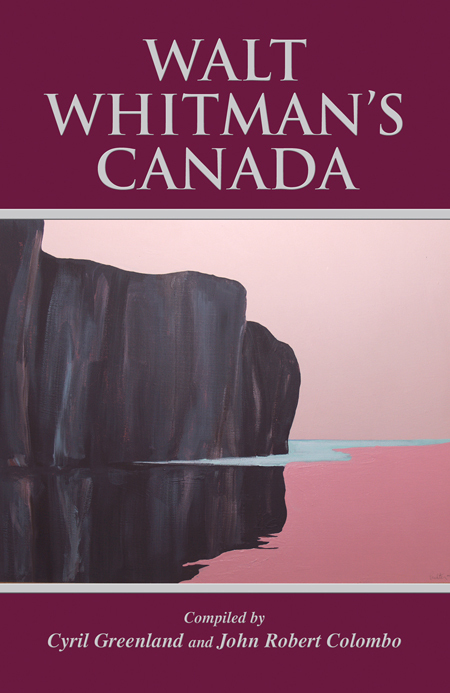 The other is entitled “Bon Echo.” and it is illustrated elsewhere in this blog as the cover for Walt Whitman’s Canada. So that’s the background, and now, all is left to me to redraft Thayer’s poem change Casey to Leacock, change the other characters to the Mariposa Rogues’ Gallery, and of course change the sport from Baseball to Cricket. I also plan to include the revised version of Thayer’s poem as well as Martin Gardner’s introduction and footnotes in the pamphlet as well. As far as 2011 Dinner goes, that’s already allocated — “The Innocence of Stephen Leacock” in which Stephen Leacock meets Father Brown, a pastiche by John Peterson. We’d put up even money now with Casey at the bat. There was Johnnie12 safe at second and Flynn a-hugging third. “That ain’t my style,” said Casey. “Strike one,” the umpire15 said. But there is no joy in Mudville18—mighty Casey has struck out. I was first introduced to Raymond Souster in January 2006 by John Robert Colombo. 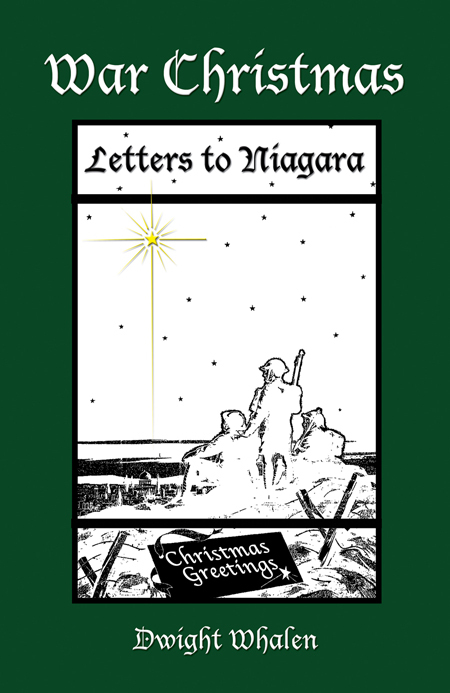 Ray had written alot of unpublished poetry since his “fall from grace” from Oberon Press. John Robert Colombo first introduced Raymond to Oberon in 1969. Raymond was now blind and still living at home with his wife Rosalia. 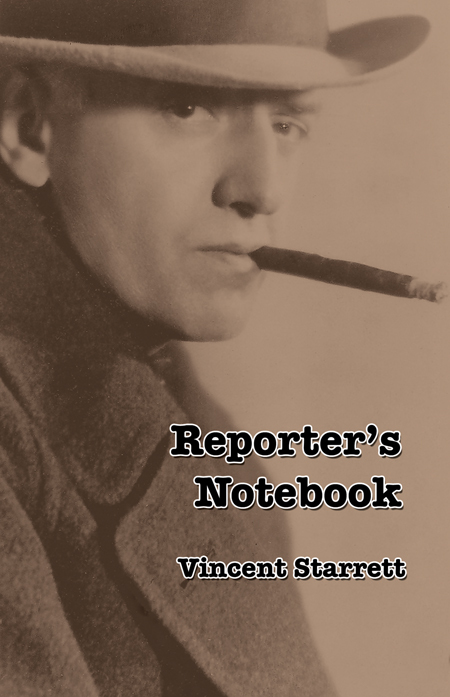 He wrote his poe…ms at the kitchen table with the assitance of a CNIB writing tablet — a thick black piece of cardboard and a spiral bound exercise book which were all carfully numbered and set aside for his Archives at McGill University. 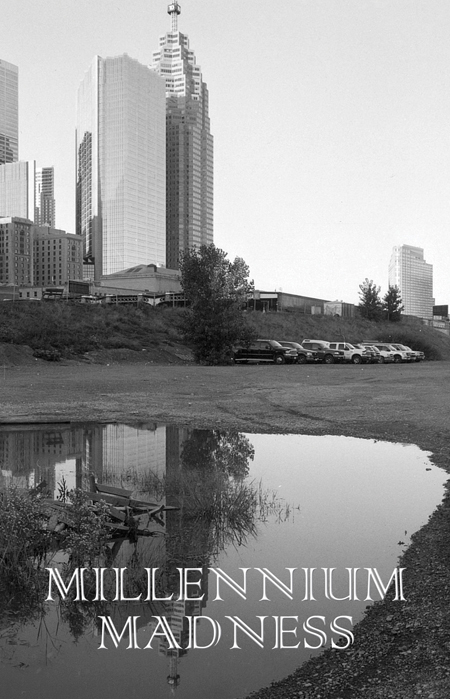 The latest single volume of poetry entitled “Millennium Madness” There are over 600 poems with an index. Raymond style has evolved over the years, but he now predominately write a 20-second poem — a poem of from 2 to 8 short lines. The reader can read a couple and its like rain off a duck’s back, but then the next one is a zinger. Raymond published and was paid for a poem that appeared in “The Toronto Star” in 1936. 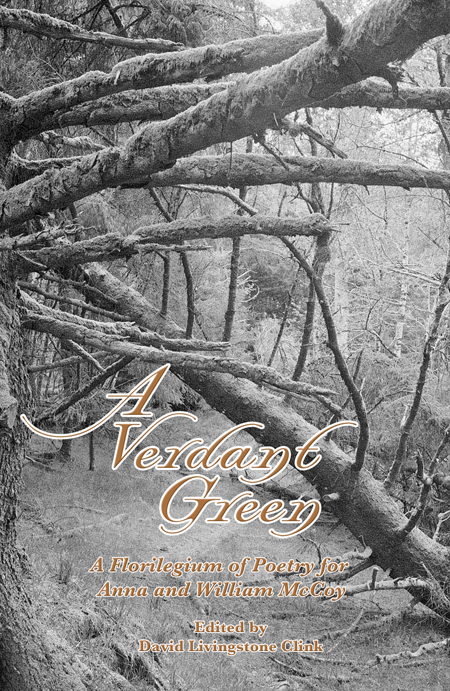 It is collected in Volume 1 of the Collected poems published by The Oberon Press. Now this means that Raymong has been published in 9 (that’s nine) decades! If you don’t believe me count them on your fingers — I just did to double check that the figure 9 was correct. Not many authors can make such a claim. The cover is a wrap around with French flaps featuring “The Toronto Railway Lands” by Geoffrey James. The tall towers are reflected in a mud puddle, and the condo towers are under construction with cranes with a view of the Rogers Centre before it was so named, formerly The Sky Dome I think. John Robert Colombo and I escorted Raymond Souster to The 2007 Toronto Book Awards. The ceremony was held at The Toronto Reference Library on Yonge Street just north of Bloor Street. The nominees all met in an area where there were refreshments, and then downstairs for Mayor Miller to make the announcement. Raymond did not win but he came away with a cheque for $1000, and his picture taken with the Mayor. The assembled multitude then adjourned to the refreshments once again, and the three of us met Geoffrey James one of the other nominees. Geoffrey had know and admired Souster’s work for many years, and accepted the offer to creat cover photographs for Souster’s next series of New Poetry volumes. I was much relieved I had travelled around the city of Toronto trying to snap suitable photos to use on the cover, all with a singular lack of success; Donna Dunlop had also taken some pictures, and while they were much better than mine, but they were still a very distant second best to Geoffrey’s offer. I got a complete set of page proofs to Geoffrey as soon as possible, and he noted that a wrap around cover with two French Flaps would have a proportion of 12×5, and what you see below is the result. The four photographs speak for themselves, but I will add captions underneath. If you are reading Ray’s poetry for the first time, I would like to offer a few lines of alleged insight. You will find two or three new poems per page, but sometimes up to six! Some are similar and the themes – comments on life, war, governments, the homeless, the underdog, the environment, acquaintances, baseball, friends, writing poetry and especially the infirmities old age, and also Mother Nature just outside his side door of his kitchen on Baby Point Road where he sits every day at the age of 87 and writes his poems every day. 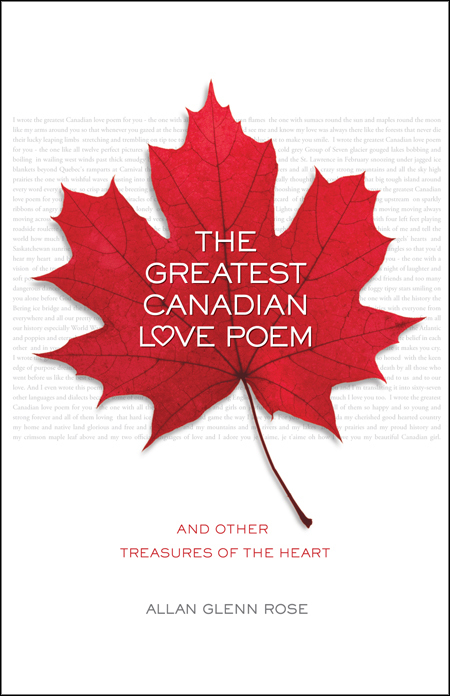 Some poems in this book were composed in November 2008. Ray writes with the assistance of a C.N.I.B writing template in successive notebooks. These notebooks are transcribed by Donna Dunlop and passed along to me on disk. Beware of the charming simplicity of his writing! Don’t look for a double meaning in his writing and certainly don’t try and complicate the message which you will receive with a less than 30 second read of an individual poem. The first two volumes appeared in 2008, and the last two appeared in 2009. More details available on the website.